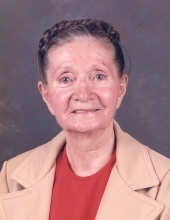 Madonna Aungst, 97, of Rosebush, passed away Sunday, February 10, 2019, at Rosebush Manor. Her funeral will be celebrated at 11 a.m. Saturday, February 16, at Charles R. Lux Family Funeral Home with her nephew, Earl Aungst, officiating. The family will receive friends on Friday from 4-7 p.m. and on Saturday one hour prior to the service. Interment will be in Two Rivers Cemetery. Memorial contributions may be made to Compassus Hospice. Envelopes will be available at the funeral home. Madonna was born October 26, 1921, in Beaverton, Michigan, daughter of the late Otis and Oda (Turrel) Spencer. She married Raymond Aungst on October 18, 1950, in Mt. Pleasant. Madonna enjoyed flower gardening and reading her Bible, but more than anything enjoyed spending time with family and friends. She is survived by her son, Marlin Spencer of Felton, CA; granddaughter, Stephanie (Ashley) McKay; great granddaughter, Ashley (Jason) Smith; great-great granddaughter, Kinley; step-son, Daniel Aungst; step-granddaughter, Melody; and numerous nieces and nephews. She was preceded in death by her parents; husband, Raymond Aungst; daughter in-law, Lorraine Spencer; and grandson, Dustin. To send flowers or a remembrance gift to the family of Madonna I. Aungst, please visit our Tribute Store. "Email Address" would like to share the life celebration of Madonna I. Aungst. Click on the "link" to go to share a favorite memory or leave a condolence message for the family.